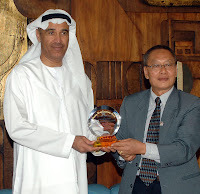 Dubai Municipality was recently awarded the Shining World Leadership Award from the Supreme Master Ching Hai, a world-renowned humanitarian, artist and spiritual leader. Eng. Hussein Nasser Lootah, Director General of Dubai Municipality was handed over the award by representatives of the Supreme Master Ching Hai International Association. The award was presented in recognition of the outstanding efforts of Dubai Municipality in promoting the well-being of the public, with its recent declaration of smoking ban in hotels, shopping malls, restaurants and cafes. Lootah, who accepted the crystal plaque award and the book gifts, shared his visions for creating a Green Dubai, and showed the visitors the Green Roofs on top of the Municipality building. He also explained them the Dubai International Award for Best Practice to Improve the Living Environment, instituted by the Municipality. The award presentation will be featured on Supreme Master Television, a 24/7 satellite TV, broadcasting worldwide via 14 satellite platforms with 60 languages and 30 subtitles. Lootah thanked the Supreme Master Ching Hai for the Shining World Leadership Award and expressed his appreciation for the noble efforts in recognizing, encouraging and promoting outstanding leadership. After the award ceremony, Mohammed Al Noori, Head of the Awards Office under the International Affairs and Partnerships Sector of the Municipality, took the guests for a tour of the Projects Exhibition Hall of the Municipality, which features the history, development and progress of Dubai Municipality.